I got a sample of this free in a magazine last year and completely fell in love with it, then, as frequently happens with me, something else must have caught my eye and I forgot about until rooting about in the bottom of one of my makeup boxes about 3 weeks ago. I love this product, it makes even hangover eyes look fresh and awake. This product states that it helps reduce puffiness, dark area's and help with fine lines. 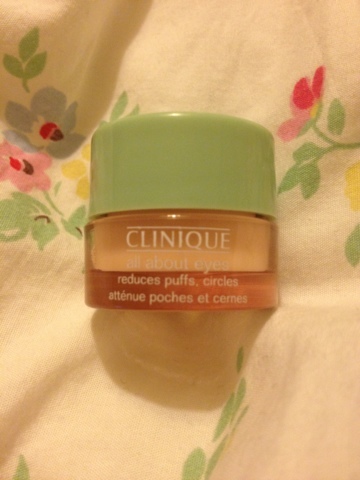 I don't know about the fine lines because I don't really have any yet, but it definitely works on me to reduce puffiness and dark circles, It's got quite a thick consistency and is quite moisturising so I tend to use this at night before going to bed so I don't get any makeup slippage and a little goes a long way with this product too. I also spotted that this also comes in a roller stick as well which looks good, so will be trying it in this form when I re-purchase! You can get this from here or here for around £23. 8 comments on "Clinique All About Eyes"
Ahh I loved this! :D I do need to repurchase, it was amazing really helped, I'm currently using Burt's Bees eye cream. Great blog hun. I just followed. I always have dark circles under my eyes, maybe I should try this! That's 3 products I now have on my to buy list after looking at your blog :)!